William Tame (1825 -1855) was born and raised in Hanslope and Tathall End. 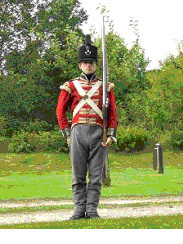 In 1840 he enlisted in the 68th Regiment of Foot. After service in Canada, Ireland and Malta, he was sent to the Crimea in 1854. He was in the campaigns at Alma, Balaclava, Inkerman and Sebastopol, where he was killed in 1855. 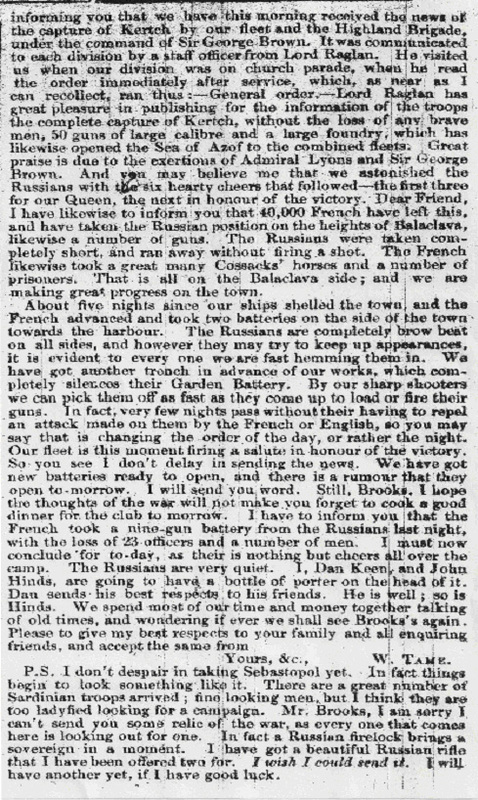 His letters from the Crimea to his friends John Brooks and Richard Cook in Hanslope were published in the local Northampton Mercury newspaper, and they are included in the narrative below. William was the youngest child of William and Elizabeth Tame nee Fern. His father was a labourer, and at the time of William’s birth on 10 March 1825, the family were living at Long Street, Hanslope, which had probably been their abode for a number of years. When William was born his parents had three surviving daughters: Elizabeth, Mary and Ann, but they had lost a son, also named William, seven years earlier, and a daughter Sarah during the year prior to the second William’s birth. At William’s birth his mother was already over forty years of age and no further children seem to have been born to the couple. As the only son of his parents and with three older sisters to fuss over him he may well have been quite spoiled. He was taken by the family to St James the Great, Hanslope, where he was baptised on 23 April 1826. Nothing further is known about his childhood; however he would have attended the marriages at Hanslope of his sister Elizabeth to Richard Cook in 1833, and his sister Mary to John Keen in 1836. We can also assume that he must have had some sort of formal education, as he would later write quite articulate letters detailing his experiences at Sebastopol. The most likely place that William received his education was the parochial school in Hanslope that was established in 1721 following a bequest by Lady Pierrepoint. In 1822 the charity was paying for a master to teach eight boys the three Rs in the vestry room of the Vicarage House. So William may at some point have been one of those eight boys. At sometime before 1837 the family moved to Tathall End, Hanslope, as it was at this address that William senior died in August 1837, aged 49 years. He was buried on 10 August 1837 in the churchyard of St James the Great, Hanslope. William junior was left presumably living with his widowed mother and his sister Ann at their home in Tathall End. By the time of his father’s death William would have been aged twelve years and likely to be already employed as a labourer and able to help support his mother, although both his mother and sister may well have been working as lace makers, as this was a quite common occupation for women in the North Buckinghamshire villages at this time. William’s world would not remain constant for long, as his mother Elizabeth died, at the age of 56 years, in May 1840. She joined her husband in the churchyard at Hanslope on 18 May 1840, leaving William orphaned at 15 years of age. William and Ann may already have been living with, or moved quite quickly in with their sister and brother-in-law, John and Mary Keen in Tathall End. 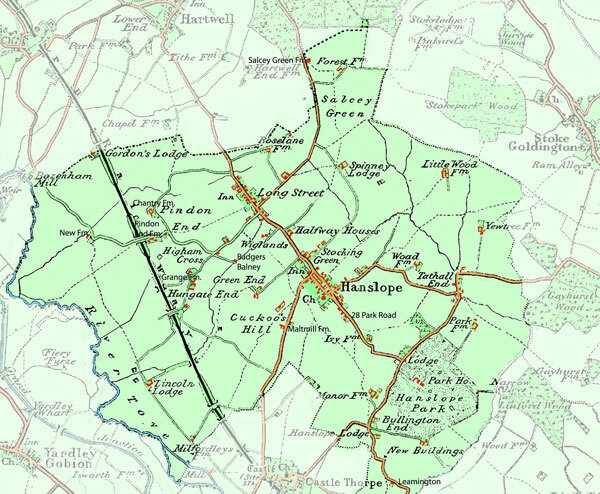 Ann is listed in their household at the 1841 census, but there is no sign of William in Hanslope on that census. The death of his mother may have triggered something in William. He was now a young single man who only needed to support himself. Perhaps he already had had a wander lust and that had had to be suppressed while his mother was still alive, or was it a spur of the moment decision? We shall never know exactly what caused William to enlist into the 68th Regiment of Foot on 28 July 1840 at Northampton. He would have been attested before a magistrate in Northampton and was the only recruit recorded for that date. William must have had his fingers crossed as he was attested as he declared he was 16 years and five months old when actually he was a year younger. We know for certain his date of birth as on 10 March 1855 he wrote a letter home where he declared that that day was his 30th birthday. From WO12/7653, held at the National Archive we learn that William was 5 foot 5 inches tall and received a bounty of three pound five shillings. William arrived at Ashton under Lyne barracks on 16 August 1840, just as the regiment arrived from Cork. The regiment would remain in Lancashire until at least the end of 1840. William received his first pay, of 42 days pay at 1 shilling and 1 penny per day including beer money, on 31 October 1840. The 68th Regiment of Foot was a light infantry regiment trained to be a fast moving strike force. 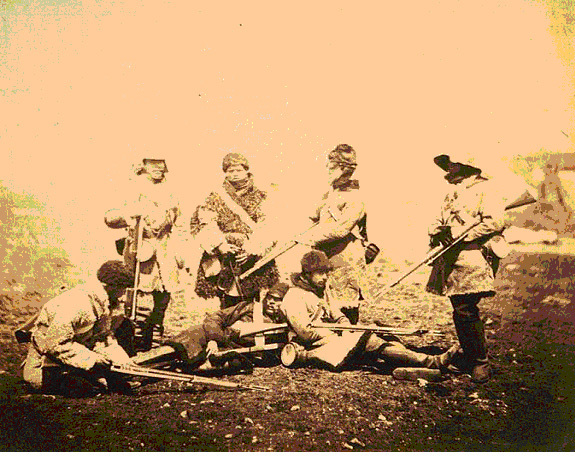 The soldiers were given extensive training and equipped with lighter muskets and new clothing to suit this role. However, when William joined the regiment it had not seen active service since the Peninsular War 26 years earlier, and by 1842 it was reported that discipline and training had slipped. In that year command was given to Lord William Paulet, who set about improving standards of all ranks until by 1848 the regiment was described by an inspecting general as a ‘beautiful regiment’. William first joined his regiment when they were stationed in Canada, and over the next 14 years he would travel widely with his comrades. From Canada they moved to Ireland and then in 1851 on to the permanent garrison in Malta, where they remained until 1854. While William was globe trotting there were changes in his family and friends in Hanslope. John Brooks, with whom William would correspond during the Crimean War, was already established as publican at the Globe Inn in Long Sreet, Hanslope. In June 1841 William’s sister Ann married James Lane. In the following year, on 3 December, his friend Daniel Keen (brother of his brother-in-law John) enlisted into the 48th Regiment of Foot. On 18 November 1843 another of his friends, John Hinds of Hartwell, Northants, joined William in the 68th Regiment. These three lads would remain firm friends through until William’s death in 1855. Both Daniel and John were fortunate enough to complete more than 21 years of service, retire on a pension and return to their home villages. In April 1847 William’s sister Mary died, leaving William with his two sisters in the village plus a number of Cook; Lane and Keen nephews and nieces. After 14 years of peace time army service, William and his regiment started to prepare for war service in the Crimea. By 7 August 1854 the 68th Regiment had been relieved as the permanent garrison on Malta and 28 officers and 841 men embarked onto the steamer Cambria, arriving at Beicos Bay on 14 August. They re-embarked on 31 August to travel on to Varna, and then by 16 September they had landed at Eupatonia, 50 miles north of Sebastopol. At this point the Regiment had already lost ten men to cholera, and the rest of the men set off, with three days rations, to march south to Sebastopol. By 19 September Lord Raglan had set up his headquarters in a cottage guarded by a detachment of 6 officers and 174 NCO’s and men from the 68th Regiment. The Battle of Alma was fought on the afternoon of 20 September 1854, the Russians being driven back in two hours. The 68th Regiment did not suffer any losses, mainly due perhaps to the regiment only coming in at the end of the offensive. This was because they were positioned on the extreme left of the Army. The two days after the battle were spent collecting wounded, and burying more dead as cholera continued to ravage among the ranks, regimental records list a further fifteen men as having died from the disease on 21 September. On 23September the army continued its march towards the heights above Sebastopol. They had been receiving a certain amount of supplies but they were also scavenging the deserted countryside farms. The Army reached Sebastopol on 27 September. Losses from cholera began to abate, but deaths and woundings from the bombardment given by the Russian batteries began to rise. 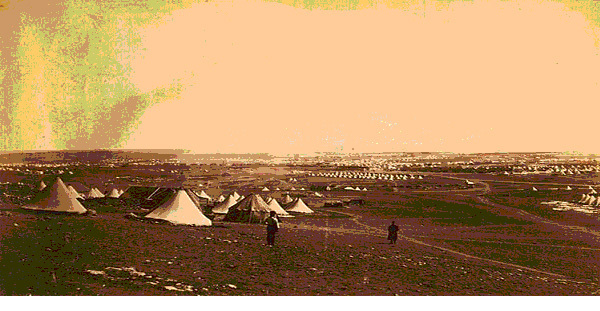 The army also suffered as supplies and equipment were very slow in coming through to the front line, such that at the beginning of October the men were having to sleep out in the open as very few tents had arrived. The Battle of Balaclava was fought on 25 October 1854, and was the scene of the famous Charge of the Light Brigade. At the time of the charge two companies of the 68th were in camp, and were called on to help prevent the complete slaughter of the Light Brigade. The contingent from the 68th was amongst those units that charged the Russian batteries at this time. The other two units of the 68th were on duty in the trenches. It is impossible to say where William’s unit was at this battle as all members of the Regiment were awarded the Balaclava clasp, on their Crimea medal. 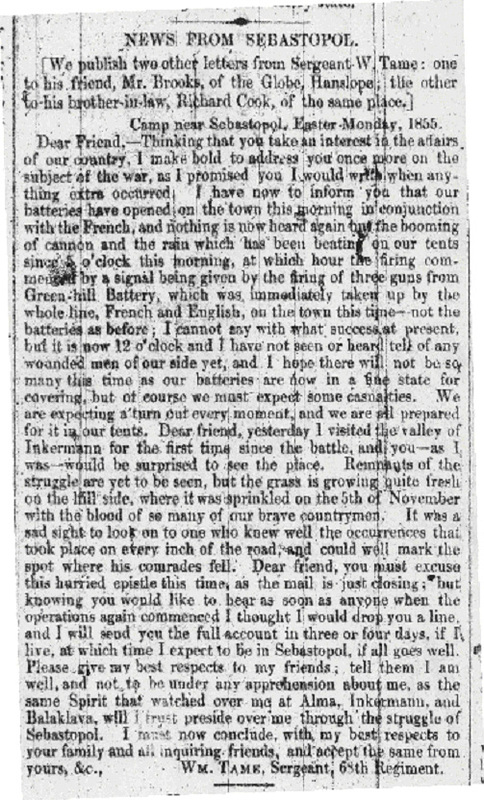 Although it is likely that he was in the units that attacked the batteries, as in his letter of 8 January 1855 he states, when talking about the award of the Distinguished Conduct Medal, that ‘I have not missed any of the skirmishes yet’. The bombardment of Sebastopol continued with the Battle of Inkerman, occurring on 5 November 1854. Fortunately we have a series of letters that William wrote home during the following seven months, when he was involved in the ongoing siege of Sebastopol. These have been preserved because the recipients of these letters, John Brooks, licensee of the Globe Inn Hanslope, and Richard Cook, William’s brother-in-law, considered the contents of the letters of sufficient public interest that they passed them onto the Northampton Mercury. The letters were reproduced in full in this weekly local newspaper. William himself therefore describes his experiences from this point on. 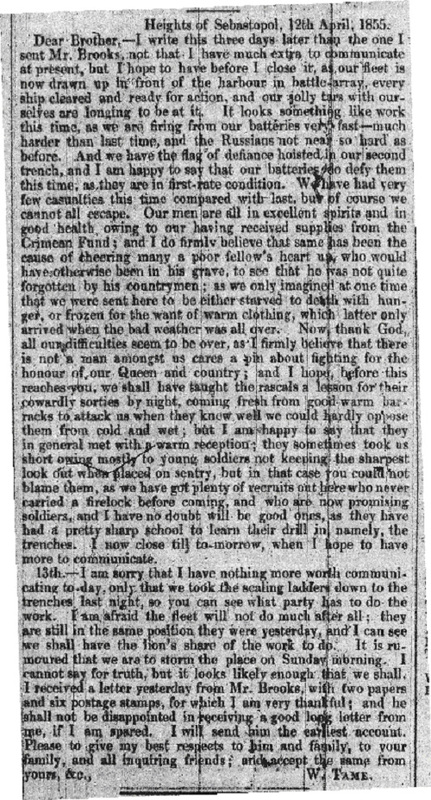 The first of William’s letter was published in the Northampton Mercury of 23 December 1854. By Royal Warrant of the 4th December 1854 Queen Victoria decreed that “one sergeant in each regiment —-shall be selected by the commanding officer, and recommended to us to grant an annuity, not exceeding £20.” The Royal Warrant continues “to order and direct the commanding officer of each regiment of infantry shall be allowed to recommend one sergeant, four corporals and ten privates to receive a medal and gratuity of “For a sergeant £15, for a corporal £10 and a private £5. The gratuity to be place in the regimental savings bank, there to remain in deposit at interest until his discharge from our service.” The medal that this Royal Warrant established was the Distinguished Conduct Medal, and William Tame was one of the fifteen men of the 68th Regiment chosen by his commanding officer to receive this medal and gratuity. In the following letter, published in the Northampton Mercury of the 10th February 1855, William has just been advised of this award and passes the information on to his brother in law. 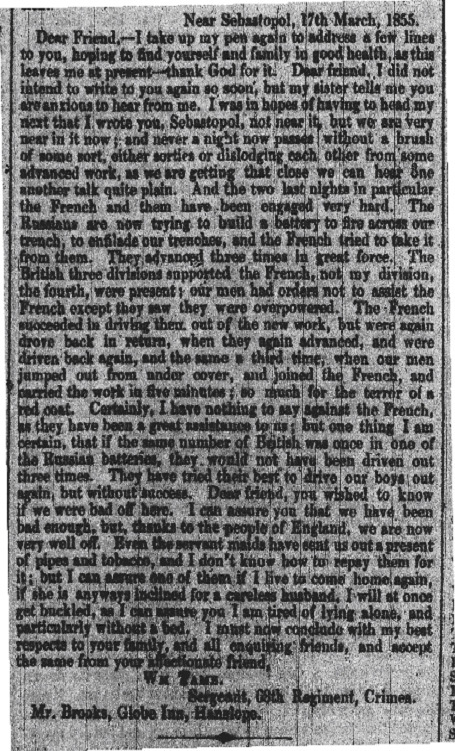 The following two letters were sent to Hanslope within a week of each other and both were published in the Northampton Mercury of the 7th April 1855. 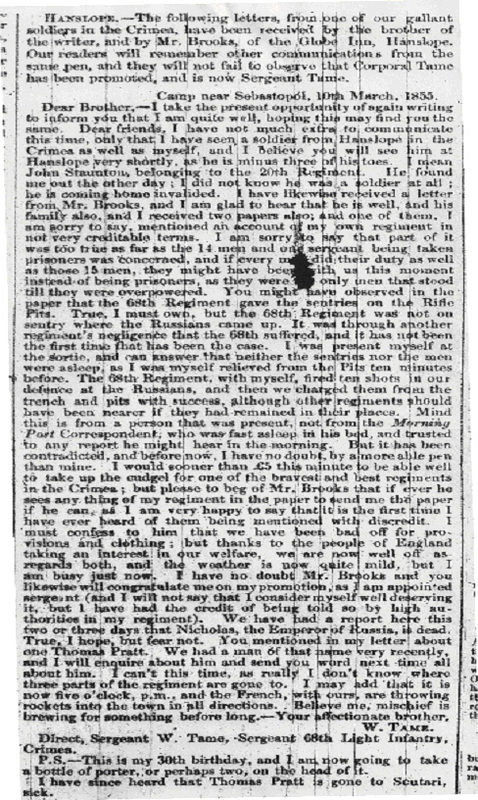 There is some conflict over William’s rank between the minimal records held by his regiment , that have him a private until January 1855 when he was promoted to corporal, and the content of William’s letters. I have corresponded with John Bilcliffe author of Well Done the 68th, a book that deals with the 68th Regiment in the Crimea and New Zealand. 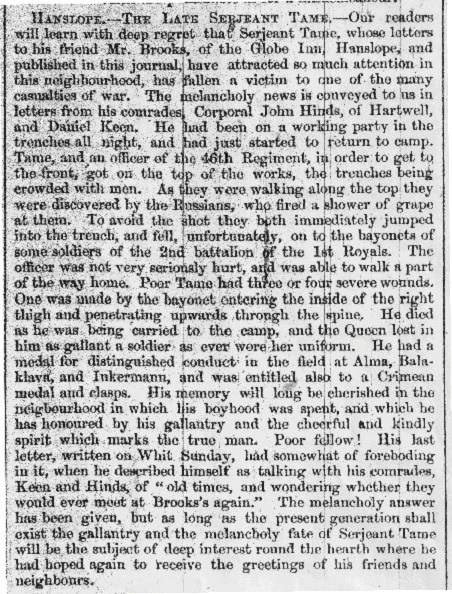 He is of the opinion that William was a private when he first went to the Crimea, was promoted first to corporal and then to sergeant quite quickly and that due to the heat of battle the relevant paperwork, presumably back at regimental headquarters, had not been updated before William’s death. The following two letters were published in the Northampton Mercury of 5th May 1855. 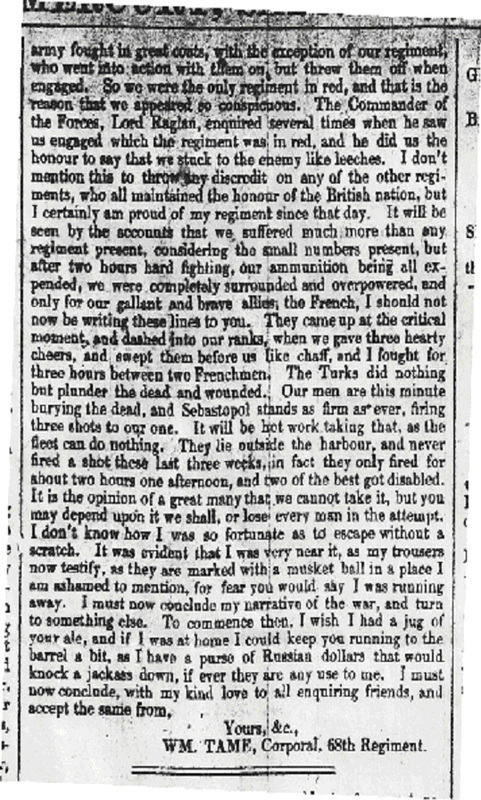 The Northampton Mercury of the 2nd June 1855 contained the following letter. The following letter was written on the 27th May 1855, but not published until the 23rd June 1855, when with the benefit of hindsight we know that William was already been dead for two weeks. 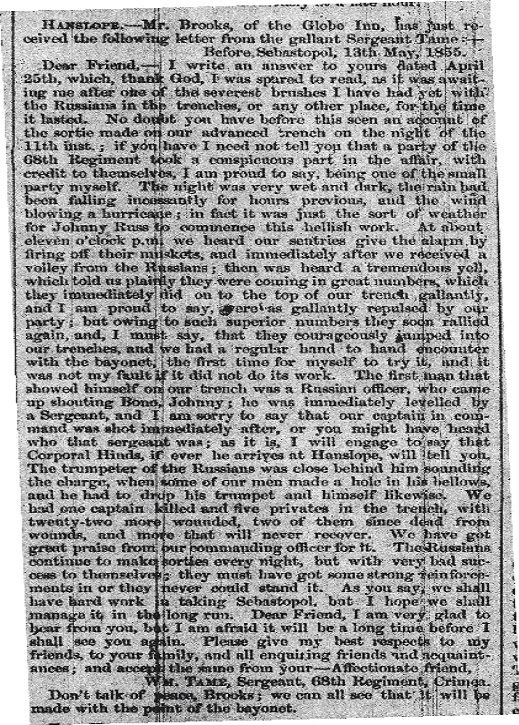 By the 30th June 1855 news of William’s death had reached home and the following tributes appeared in the Northampton Mercury. William is likely to have been buried in the Woronzoff Ravine, near Sebastopol, where the cemeteries of the 2nd and 4th Division are located (the 68th was part of the 4thDivision). No memorial was recorded on his grave when Colborne and Brine recorded all the memorials of the Crimea cemeteries in 1857, but he, along with those of his colleagues who also died there, is remembered by the memorial that was erected in Durham Cathedral in late 1859. No other memorial to William is known. 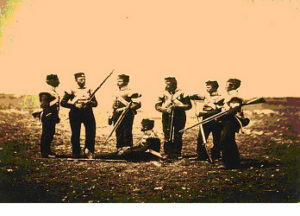 William’s regiment remained in the Crimea for several more months before Sebastopol was finally taken and peace declared. William was awarded the Distinguished Conduct Medal; the Crimean medal with the four clasps for Alma; Balaclava; Inkerman and Sebastopol and the Turkish Crimean medal. These three medals are all on display together in medal case 27 at the museum of the Durham Light Infantry in Durham. 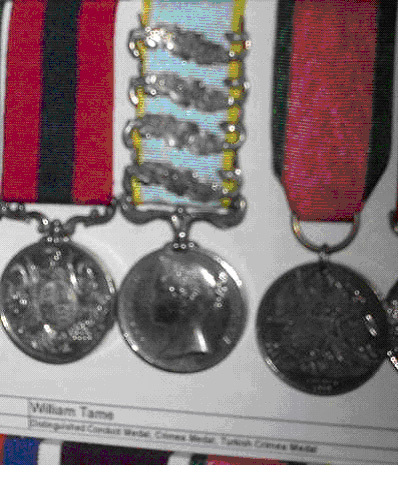 Each of these medals is engraved with William’s name and regiment around the edge. 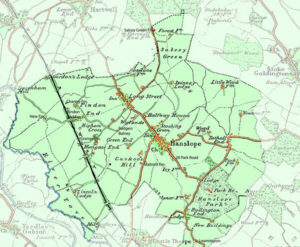 Source material from: Hanslope and District Historical Society website provided much of the Hanslope related information included in the article. The Durham Light Infantry Museum. Copies of the Northampton Mercury held at the Central Library Northampton. Well done the 68th, The Durhams in the Crimea and New Zealand 1854-1866 by John Bilcliffe. Crimean War photographs by Roger Fenton Mar-June 1855, from allworldwars.com. Andrew Plant, Durham and North East researcher for the photograph of William’s actual medals. The last of the Brave, or resting places of our fallen heroes in the Crimea and at Scutari by John Colborne and Frederic Brine.